"Alii is the Hawaiian word for Royalty' , and our condo is this and much more, it is Luxury at its Best. When we say DIRECT OCEANFRONT, we mean it... This completely redesigned and remodeled Top of the Line PREMIER DIRECT OCEANFRONT 2 bedroom, 2 bath condo stands alone in its class. The condo is located in building Three, Oceanfront building, and on the front ocean side, as well as the South End of the 5th floor. A Five Star Plus award wining Luxury condominum, and there is nothing that compares to the Location and Views of this very spacious 1900 square foot DIRECT OCEANFRONT condo along the famous Kaanapali Beach Resort. The resort offers Beach Towels and beach chairs at the pool cabana for all guests staying at the Alii. Stop by the pool cabana and check out all the services they have to offer you! Our condo is OWNER OPERATED AND MANAGED. The condo unit is not in the rental program with Classic Resorts. You can book our condo unit #356 here directly through our site. This luxury “Premier” Two Bedroom / 2 bath Direct Oceanfront condo offers breathtaking PANORAMIC OCEAN sunsets and unobstructed views of the blue Pacific with expansive views of Lanai and Molokai. We have installed new Lanai doors that retract back to let the outside in! Our PRIVATELY RENTED premier condo will sleep up to a party of six comfortably and offers 1,900 square feet of pure direct oceanfront luxury . “Premier” assures you that this is the best! Our renovation of this direct Oceanfront luxury condo included new designer furniture, stone countertops, travertine flooring, a beautifully appointed kitchen and newly designed baths. Entertainment amenities will include flat sceen TV's, DVD and I-HOME PLAYER SYSTEM , with Wireless internet service available in the condo. You will be completely dazzled and amazed when you walk thru the front entrance. The new large open floor plan, it is all brand new! You will fall in love! In fact you will not want to leave..... ever. The whole family will appreciate the extra level of luxury offered by our Kaanapali Alii Premier Direct Oceanfront luxury condo. 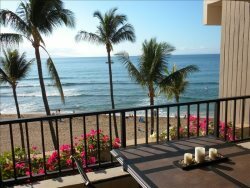 Just imagine your next vacation at this special Oceanfront condo in West Maui!! Now this will be your Paradise! !